To the extent that the average Floridian has heard of premises liability, they have likely heard about it in the context of a person slipping and falling in a supermarket. However, there are many other situations in which premises liability law apply, and many if not most are ignorant of them, even when they might benefit the injured party. Understanding your rights may be important. Historically, premises liability was a concept seen primarily in common law – in other words, in the lessons learned from past cases, which influences our future rulings, as opposed to in statutes put out by the legislature. The concept is quite an old one, dating back to the medieval era, and while it has undergone modification in the ensuing years, the core of the issue has not changed. At common law, a property or business owner has a duty to, at the very least, refrain from injuring one’s guests, though that duty can go all the way up to the obligation to warn a guest of a potentially dangerous condition. At common law, there were three different classes of people when classified as present at a specific property, and each is owed a differing duty of care (that is, a differing duty to the person entering upon their land), depending on their status. A trespasser is owed only the property owner’s refraining from actively attempting to injure them. A licensee is someone who is on the land for their own reasons (as in, not invited), and is also not generally owed much care by the property owner. An invitee is someone who, as one might anticipate, has been invited onto the land by the owner, for business or public purposes (for example, a contractor modifying the house, or a paying visitor on a tour). They are owed the highest duty of care. 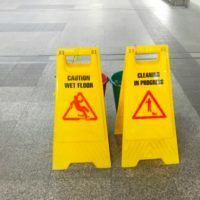 While the majority of premises liability cases that the average person encounters are grocery store slip-and-falls (indeed, it is one of the only aspects of premises liability which has statutory coverage), there are many, many other types of cases that would fall under this legal area. Some others include negligent security cases, when it is alleged that the property owner did not provide enough security to prevent harm, and some types of dangerous animal-related cases. It is important to keep this in mind, if only because so many people simply have no idea that any type of accident on someone else’s land other than a slip-and-fall might be actionable. That said, it must still be possible to show that the property or business owner was negligent in their conduct before you may be able to recover on such a claim. The normal rules of personal injury law do apply – you must be able to show that a duty of care was breached by the conduct of the defendant, and that it caused tangible harm. You must also be able to show that you were lawfully present on the land in order to have any real recovery – trespassers are not technically owed a duty of care, since they would be breaking the law while injured. If you are injured on someone else’s property, and you have a reasonable belief that it was due to their own negligence, you may have a case. The Orlando premises liability attorneys at the Hornsby Law Group will sit down with you and talk through your options. Contact us today to set up an initial consultation.